From injury rehab to circus moves, there’s a fit for you. 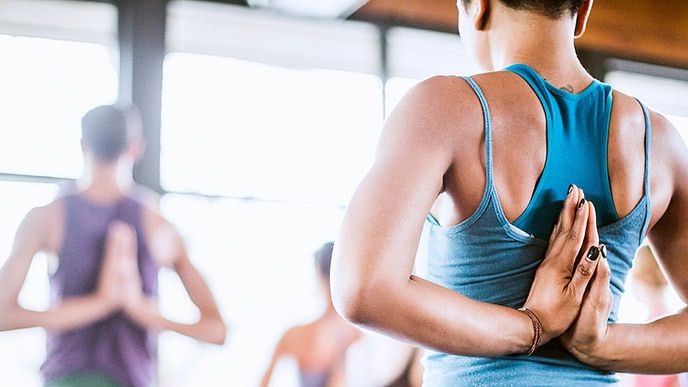 These days, yoga is taught in a wide range of dedicated venues, from small, local studios to glitzy, spa-like franchises of large international corporations. It’s also offered as an “added value” at gyms, fitness clubs, wellness and community centers. A strong workout for increased fitness? Greater strength and flexibility to complement other sports? Achieving athletic or acrobatic poses? Rehabilitation from injury (on your own or doctor’s orders)? Vinyasa and Flow classes will give you a workout; classes with descriptors like “Power,” “Bootcamp” and “Kickasana” will be even more challenging. AcroYoga, Aerial and Circus Yoga cover the acrobatics while Hatha, Aligment, Iyengar and Yin move more slowly for rehabilitation. Restorative and Therapeutic classes will address physical and emotional trauma. Is it well managed? Thorough, clear presentation bodes well—online, in brochures, and in conversations with staff. Is the class schedule convenient, consistent and diverse? How long has the studio been around? Harmony and longevity are good signs. Low teacher turnover suggests a good working environment. Yoga is not a one-stop shop or quick-fix 30-day fitness and weight-loss program. It takes time to master its physical and mental aspects, and thus to enjoy its full spectrum of benefits. How is its environment, atmosphere, “community feel”? Music blaring and weights thumping do not constitute the best background for settling, and getting grounded into your poses. A good yoga practice breeds calm, focus, quiet strength and community support. Each studio has a unique vibe: Find one where you feel relaxed, aware, full of vitality, connected to yourself and to your fellow students. What is its overall philosophy? Remember, yoga serves not only your physical needs but your mental, emotional and spiritual ones, so a clear statement of principles is paramount. What’s the takeaway? In short, after all your research, give a studio a couple visits and, as a yoga teacher might say, listen to your inner voice. To use a food analogy, if you feel nourished by a class, keep going. If you’re still hungry, look elsewhere—your fulfilling studio is out there.